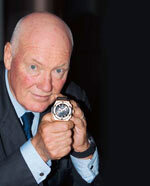 ...says Jean Claude Biver, CEO & Chairman of Hublot, who speaks about India's growing importance in the market for luxury Swiss watches. M: Are Swiss watches raising a toast to India? JCB: They most certainly are. You can sense the entrepreneurial zeal and innovation as businesses get more autonomous and competitive. This is the kind of market that's best for the growth of Swiss watches like Hublot. M: What makes India such a lucrative sales ground? JCB: Earlier, Indians had to travel outside the country to buy a timepiece; now, no more. It's interesting how the buyer's intentions work. While Swiss watches may be available in just a handful of stores across the country, India's sales figures are highly regarded. M: Are we going to see Hublot stores in India soon? JCB: By 2011, we'd like to have standalone stores in at least the metros. There's definitely the interest and after gauging the market, we're looking forward to move to B-cities. M: In the luxury watches segment, what innovations are we likely to see? JCB: There are always new mechanisms being experimented with. At Hublot, we're interested in fusion-that of tradition and the futuristic. The "Time Machine" watch, which has a seethrough dial and counts down to the time you need to wind it typifies this. Of course, this is a limited edition-only 200 watches were made and it costs a quarter of a million dollars. But we enhance our experiments to get to a product that best reflects our motto: Reinterpreting tradition.